Whisk together milk, eggs, and spices. Place bread in bowl and let stand 5-7 minutes. Meanwhile, place 1-2T butter in a glass 9x13 baking dish. Once melted and bubbling, remove from oven and spread butter around. Transfer soaked bred to pan and sprinkle with cheese. Bake at 350 degrees until puffed and golden, about 25 minutes. Bring 2 inches water to a boil with a teaspoon red wine vinegar in a small deep skillet or saucepan. Break each remaining egg into a cup and slide into water, spacing eggs apart. Poach at a bare simmer to desired doneness (we prefer firm whites with runny yolks, 2 to 3 minutes). Meanwhile, toss greens with remaining 2 tsp. vinegar, oil, and salt and pepper to taste. Divide French Toast between plates and top with salad. 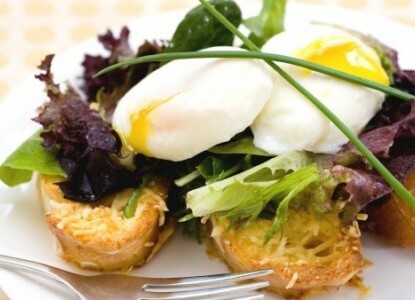 Lift eggs out of poaching liquid 1 at a time with a slotted spoon and place on top of salad. Lightly season eggs with salt and pepper and top with a sprinkle of parmesan cheese.